T-Fal 5-Qt. Pan Just $16.72! Down From $50! FREE Shipping! You are here: Home / Great Deals / Amazon Deals / T-Fal 5-Qt. Pan Just $16.72! Down From $50! FREE Shipping! Exclusive for Prime Members only! Hurry over to Amazon where you can score this T-Fal 5-Qt. 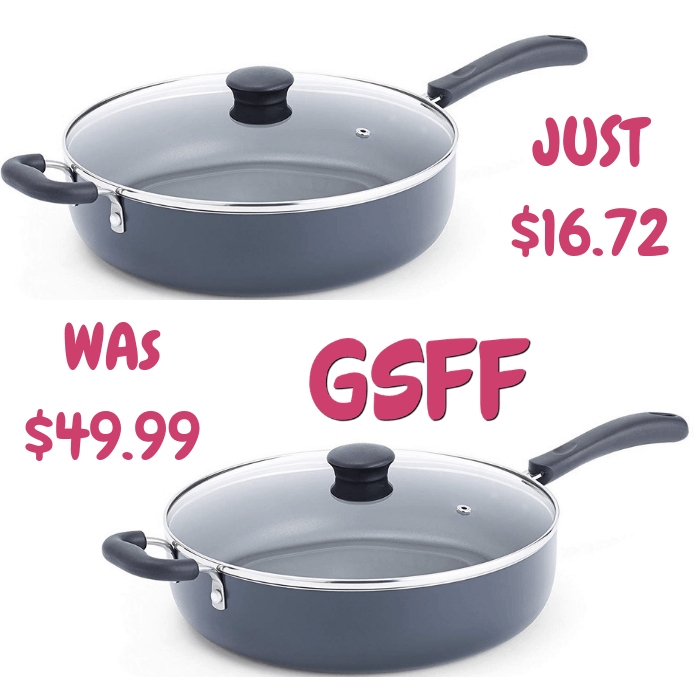 Pan for just $16.72 down from $49.99 PLUS FREE shipping! The T-fal Specialty 5-Quart Jumbo Cooker Sauté Pan is an essential pan for every day cooking. The large cooking surface and deep sides make it easy for family cooking and one-pot meals. Great for simmering, sautéing, and braising. T-fal’s durable Easy non-stick interior and exterior makes cooking and cleaning a breeze. The quality non-stick interior allows cooking without fat or oil, making healthy cooking easy to achieve. Food releases easily from the pan’s surface so you won’t have food sticking to the pan.